Do you want to convert files without having to download software? If so, you need a reliable online converter. If you are up to converting AVI to MPEG online, you’ve come to the right place. But before tackling the steps, let’s take a closer look on a brief description about AVI file. Audio Video Interleave or AVI are files with an (.AVI) extension. AVI integrates audio and video in single file using a standard contained which permit simultaneous playback. Due to its simple architecture, it runs to various systems like Linux, Mac, UNIX and Windows. Also, it is supported by all popular browsers. Step 1 Find an online converter that can convert AVI to MPEG. One of the most reliable online converters that you can count on is Online-convert. All you have to do is to simply choose your files, upload them and online-convert will automatically convert them. Choose your file that you need to upload. After selecting the files that you have to upload, choose MPEG as the output format. Before converting, choose quality ranging from lower to extreme, then click Convert to start AVI to MPEG conversion. After that download the converted MPEG files to PC. AVI to MPEG online converter supports DivX, Uncompressed, xvid, etc. By doing so, you also work on VCD, DVD and SCVD formats. Say for instance, you can convert audio stream or video stream to separate files and then convert the MPEG frames into images. 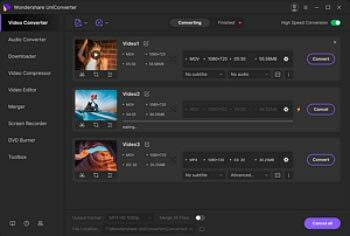 Also, an editor is used in converting AVI to MPEG in order to add effects of MPEG and AVI videos at the same time crop them with ease. With the use of an online converter, you can seamlessly convert AVI files to MPEG, and vice versa. Just add the files to the program, choose the output format, and you are good to go. Another easy way of converting AVI to MPEG is to make use of a desktop video converter. By using such software, you can convert MP4, AVI, WMV, MOV, FLV, and MPE file formats with ease. One of the most comprehensive and stable converter stable video converters today is Prism. It converts and compresses video files in just few minutes, supports all popular formats and with batch video conversion in order to convert thousands of videos. If you need more than just a converter, Wondershare UniConverter (originally Wondershare Video Converter Ultimate) is the best answered prayer for you. It is your ultimate video tool box that would surely meet your specific needs when it comes to video conversion, which not only allows you to convert but also to edit, download, enhance, organize, burn, enhance and watch files in more than 150 formats.